For example, on June 8th we are helping to run a breakfast briefing with occupiers within the WeAreWateroo BID focusing on ‘The State of the High Street’ in London. We’ve recently installed 10 footfall sensors within the WeAreWateroo BID boundary to understand the different pedestrian flow patterns around the area. This breakfast briefing gives us the opportunity to delve into our footfall data for this area and across London, where we now have over 250 sensors installed in a variety of location types. It’s also a good time to review the relative impact of key events in London over the last few months, to follow on from my previous blogs discussing the impact of Valentine’s Day and Mother’s Day on footfall, and to get feedback from the front line about how the data translates into reality. So I’ve taken a sample of 63 footfall sensors with at least five months’ data within the boundaries of several BIDs we work with, to identify any common themes/patterns and to build a picture of the different challenges and opportunities they face. The BIDs within central London (e.g. Bee Midtown, AngelLondon and HammersmithLondon) are all dominated by Leisure occupiers (almost 50% within some BID boundaries), and especially by Restaurants and Cafes & Fast Food. Much of the footfall in these locations is linked to local workers / office populations and nearby tube/railway stations, often with three distinct daily footfall peaks around 9am, 1pm and 6pm and relatively quiet weekends. In contrast, the BIDs in outer London (e.g. Bromley, Kingston) all have at least 30% of occupiers classed as Comparison Goods, with Leisure occupancy accounting for a lower proportion of premises in each location. Map 1 shows the data for Bromley, where Comparison Goods occupiers account for 40% of premises and Leisure is 21%. Footfall in the town tends to be strongest on Saturdays and around 2pm. Map 1: Bromley Town Centre - a shopping destination. Comparison Goods (blue dots) = 40% of occupiers. The difference in the occupancy profile gives some idea of what we’d expect when we compare the seasonal footfall patterns; and these two zones of London do indeed behave very differently. The most noticeable pattern is the difference between central London and outer London during the new year period. In the week ending 15th January, central London was still recovering from the exodus of workers over the Christmas period with a 17% footfall increase on the previous week and the growth that continued until the end of the month. In the more suburban ’shopping destinations’ such as Kingston, Orpington and Bromley, town centre footfall declined in the first half of January as commuters returned to work in central London after the Christmas surge. The highest increase was seen in the week ending 19th February (probably due to Valentine’s Day - see more about the differential impact of this day on our city centres here), but this trend was much less pronounced in central London. Unsurprisingly in central London, the decline was concentrated around office locations such as Holborn. But nearby tourist locations such as Great Russell Street (British Museum) showed an increase in visitor numbers: +13% versus the previous week. Both these locations are within the Bee Midtown boundary, illustrating the challenge that BID managers have in managing different seasonal patterns across their areas, often within close proximity. In Outer London, Kingston saw a weekly increase of +2.5% over Easter, driven by certain areas with a strong night-time economy. The highest week-on-week increase in Kingston was especifically during the week ending 19 March (+9%) mainly from the clubs on the edge of the town centre, which hosted more popular live entertainment than usual. 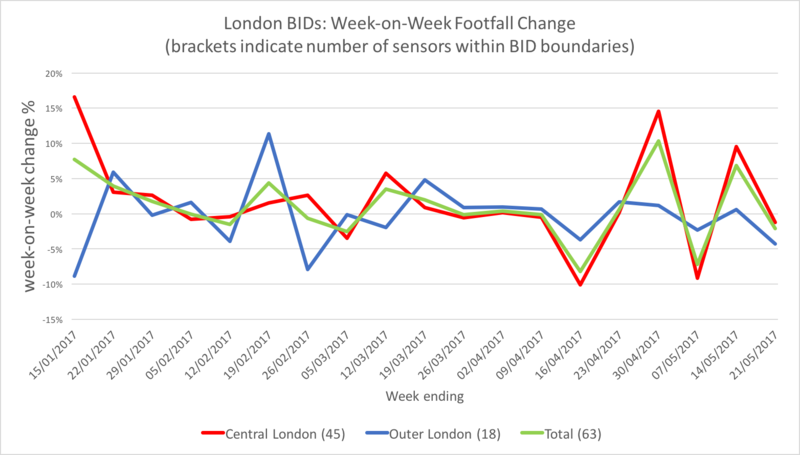 The greatest footfall increase in these London BID areas during Spring were during the week leading up to the May Day weekend (week ending 30/04: +10% in total and +15% for central London). 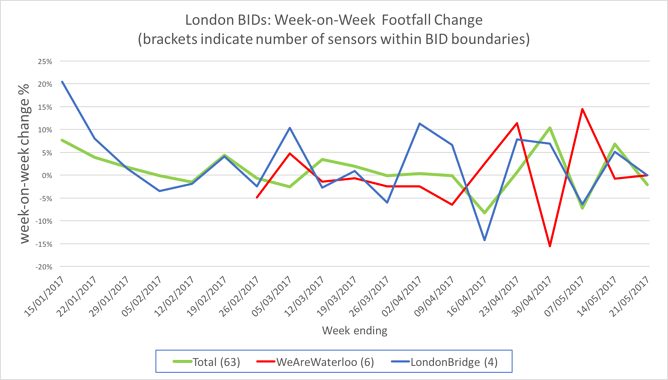 However, the WeAreWaterloo BID area saw a 15% decrease during this week, with all 6 devices included in the sample taking a hit to varying degrees (ranging from -32% to -5%), following an increase in the previous week – see Figure 2. Waterloo Station inevitably has a large role to play in the seasonal ebbs and flows within this area, but other BIDs located near central London’s main transport hubs do not necessarily experience the same seasonal trends. Not far to the East, sensors within the Team London Bridge BID boundary show several weeks that contrast to the trend around Waterloo, and during these weeks of difference, the sensors within the area, occasionally showed a contrasting picture due to localized events. These patterns highlight the importance of having a number of sensors across an area to provide a robust indication of seasonality. With only one or two footfall counting devices within a town centre, the influence of micro-location factors such as nearby occupancy / retail mix and seasonal events means that the patterns can vary significantly from one street to the next. If you’re a BID manager or landlord who relies on data from no more than a handful of sensors across your area, the relatively low cost of new footfall sensor technologies makes it much more viable to build a more reliable picture of what’s happening in your centre from a network of devices. 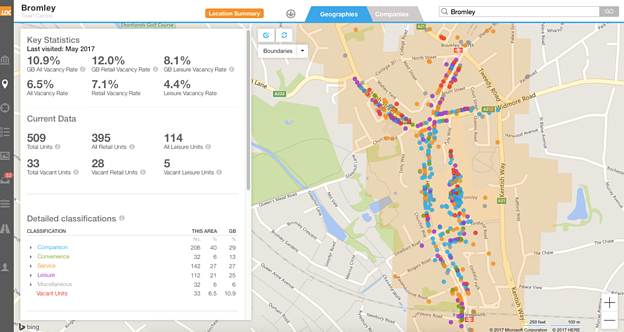 For occupiers with stores within a BID boundary, you can now benefit from the ability to benchmark footfall trends in your location against other streets in the area, providing rich contextual data to help explain your performance during any season or event. 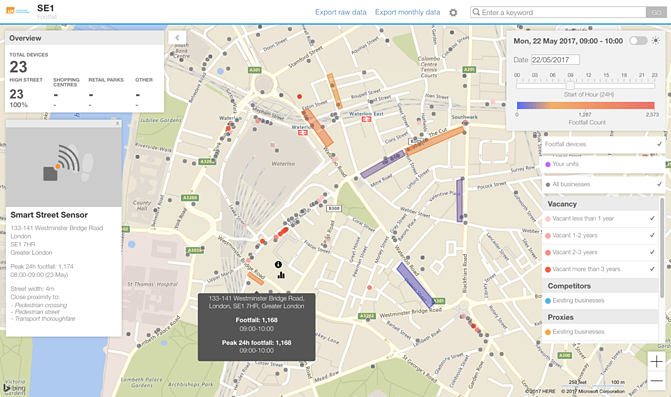 Footfall Maps Dashboard (See Map 2) that enables you to view hotspots for any hour on a ‘street segment’ and overlay existing occupiers / vacant premises to add context to footfall trends. Example shows 9am-10am on Monday 22nd May in Waterloo. Map 2: Footfall Map Dashboard showing footfall in Waterloo on Monday 22nd May between 9 and 10 am. To find out more, visit our Footfall page. If you have any questions, or would like to speak about measuring footfall in your location, you can email Chris at chris@localdatacompany.com.